This piece began from following the scrolls and blooms edging a vintage doily. 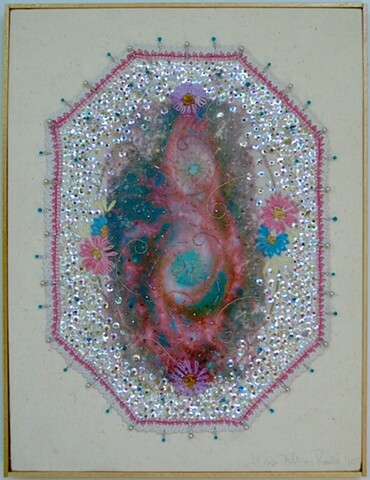 It seemed right to create a kind of constellation or sense of cosmic order to expand the open inner space. I explored the Hubble images and printed Eyes in the Sky, Courtesy NASA/JPL-Caltech on Pictorino film. So far away and yet closer than close, I pair the exploratory sense of the macro with the ever so micro - small scrolling stitches into the tulle, sequins and Delica beads expand the edges into glowing starlight.